Our long years of catering experience have enriched us with vital expertise as well as a vast resource of world-leading vendors. 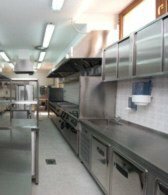 We can offer tailor-made kitchen designs conforming to HACCP (Hazard Analysis and Critical Control Points) specifications ensuring cost optimization without compromising on quality. Coffee shop or extensive food court. Mess halls or five-star clubs. Schools or labour camps. Spinneys Catering & Support Services professionalism ensures the same standard of excellence from the smallest to the biggest projects.